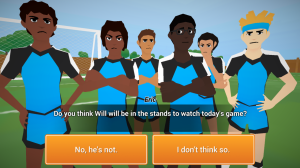 One change that has had a positive impact on the game is the decision to expand the amount of choices the player can make. So how did the team come to this decision? QA testing remains a cornerstone of BREAKAWAY mobile’s success. Seeing the game in the hands of new users is a crucial step in creating an experience that engages the player while ensuring that the “North Star” remains the priority.